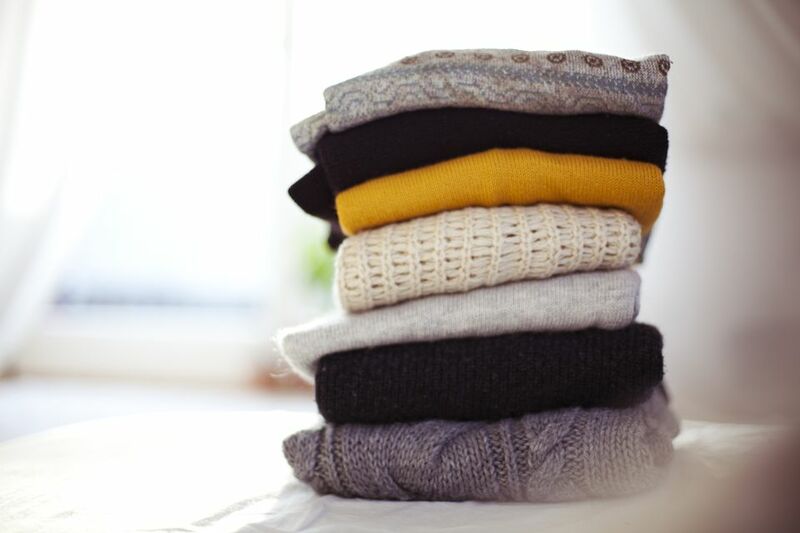 No matter your home's size, storing winter clothing has its challenges. Experts share their favorite tips and tricks for packing seasonal clothing and footwear. Edit. 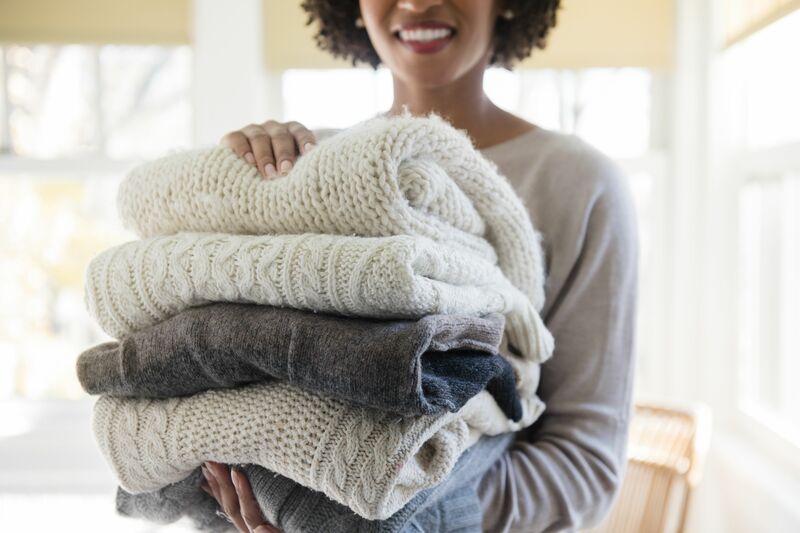 Are you holding on to sweaters and coats you have not worn in years? Do you have a collection of mismatched gloves and leaky boots? If the answer is yes to any of the above, it is time to let go. Wearable items that are in gently worn condition should be donated. Clean. Salt, snow, and mud — winter gear takes a beating so you should clean your things before storing. Soiled items that cannot be tossed in the washer or dry cleaned like winter shoes and boots should be wiped or brushed. Protect. Prevent moths from munching on your stored sweaters with an eco-friendly moth repellent. Cedar, lavender or cinnamon sachets will also work. Big bulky Items. For storing things like puffy jackets and snow pants in the offseason, vacuum sealed storage bags work well to compress and take up less storage space. Large plastic bins work well, too, as you can press a lot into these containers. Small accessories. An excellent way to store and organize hats, gloves, mittens, and scarves are closet-door organizers with lots of pockets. It is a smart storage solution that will help you match gloves and mittens while keeping hats and mufflers easily accessible, but out of the way. Winter footwear. For boots and winter shoes, it's best to dry them off, wipe them down and keep in clear storage bins during the warmer months. Since winter shoes are bulky, it's best to keep them out of the way and out of sight in an attic, garage, or closet. Put empty luggage to work. Empty suitcases (not duffel bags) are great for storing offseason items, especially if you do not travel more than a couple of times per year. After you pack away your belongings keep your luggage in a cool, dry place. For example, damp basements, unheated garages, or outdoor sheds are not the best places for keeping your belongings in tiptop condition. Invest in a specific type of vacuum seal bag. Soreff says the best ones to use are long and flat bags because once stuffed they can easily fit under your bed. Rethink closet space. These days you will find a large assortment of hanging storage caddies for everything from sweaters to scarves that can easily double your closet's capacity. Collapsible, hanging shelving made of fabric is a favorite To get the biggest bang for your organizing dollars, invest in an option with cedar panel inserts, which will freshen and protect clothing. Best of all, collapsible storage solutions do not take up much room when not in use. Just fold and put in a drawer or on a shelf until needed. Recycle orphaned or damaged items. What to do with unmatched socks, gloves, or mittens? What about that sweater that is beyond wearing? Donate them to a local textile recycling center. Use Google to find a location in your area. Kate Hart is the cleaning expert at U.K. based Fantastic Removals. Below you will find her ingenious tips for packing bulky coats and snow boots. As we mentioned earlier, Hart says you must wash or dry clean all of your things before storing. FYI, snow, salt, and dirt can stain or damage clothing if not removed beforehand. Once your clothes are clean, she suggests the following to keep them fresh for next winter. Humidity packs: If you are packing your things in vacuum bags, Hart says you should throw some humidity packs in between or around the stored bags to keep humidity out. Boots: After giving these items a good cleaning apply a layer of wax to leather footwear. Let the wax soak in for several days before putting your boots away. Hart also suggests putting humidity packs inside your boots, just in case, and then stuff your boots with newspaper, so they stay in shape when stored. It is particularly important to do if you are storing tall boots, which should always be stored upright. Shoes and sneakers: When storing these items Hart suggests stuffing these items with charcoal odor busters made for shoes. They are one of the most effective ways to banish funky smells. Leanne Stapf, the Chief Operating Officer at The Cleaning Authority, takes a creative approach to storing winter clothing. Winter hats: Are you proud of your collection? Then if they are collecting dust at the top of your closet, it is time to move them out and show them off. Stapf suggests hanging your hats on a cord or chain on a wall using a clothespin. Scarves: Head to your nearest home improvement store and pick up a cheap towel rack and voilà, you have a scarf organizer. Secure the towel rack to the back of your closet and knot each scarf over the bar. If you have more scarves than can fit, secure an additional towel rack underneath the original. Mittens and other Accessories: Over the door shoe organizers are perfect for storing small items like these. Even better unlike a drawer or basket, the individual pockets keep coordinating accessories together, so you do not have to dig around to find gloves or mittens. Susan Santoro is the professional organizer and blogger behind Organized 31. She shares two insanely smart tips for storing winter things using items that typically get kicked to the curb. Repurpose 1-liter plastic soda or water bottles. Santoro stuffs them inside boots to keep them in shape. The best part? You can recycle the bottles when it is time to wear or get rid of your footwear. Turn wine boxes into shoe storage. The cardboard sleeves inside (see photo above and here) make them perfect for shoe and boot storage. For wide shoes, you can bend or remove the cardboard slots. Santoro says this storage trick has worked particularly well for her college-aged daughters.